Stick arcade PS3/PC pertama kita, yang dibuat di bulan November 2009. 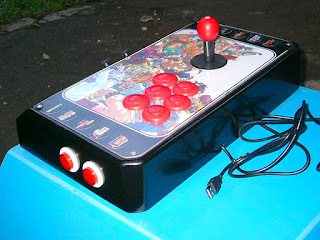 Pakai stick handle Calle battop(modded), tombol platina. Artwork nya gambar yang tampilin semua karakter Street Fighter 1-3. Dan untuk area kosong di samping kita taruh logo-logo game Street Fighter. Our very first PC/PS3 arcade stick, built on November 2009. It used the old but modded Calle stick, leaf-switch buttons, generic PC PCB. The artwork displayed every Street Figher character from SF1-SF3. And we fiiled the empty space on the sides with Street Fighter logos. Proses rakit stick ini merupakan proses yang lumayan panjang. Awal nya kita buat casing & pasang PCB dual shock 3 abal2 yang kita beli seharga 200 ribu. Sewaktu dilihat dalam nya itu hampir sama dengan PCB USB generic yang harga nya lebih murah. Sesudah disolder PCB ini malah jebol. Kecewa berat karena modal kita yang kecil sudah habis untuk lanjutin proyek stick arcade PS3 kita. Tapi suatu hari kita iseng2 coba stick ini di sebuah rental PS3, kali ini pakai PCB USB generic.. Wow jalan stick nya. Pulang ke rumah stick ini kita sempurnain, kita tes lagi di kemudian hari di SFIV, dan stick nya memang jalan sesuai harapan. The process was a quite long process. We began the project by molding the case, installing a bootleg Dual Shock 3 controller we bought for Rp 200,000. When we saw the inner parts of the PCB, it looked very similar to a cheaper generic PCB. And when hacked the PCB it broke. Disappointed; we no longer had money to continue this project. But one day out of curiosity we tried this stick at nearby video game cafe, this time the stick used a generic PCB. Wow, it actually worked on a PS3. We went back to improve the stick, tried it again a few days later on SFIV, and the stick worked as expected. 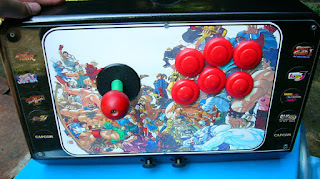 Selanjut nya kita modifikasi stick ini dengan pendekin batang besi stick, ganti ke balltop, belajar buat balltop sendiri, belajar bikin bungkusan batang(shaft cover), coba pakai tombol platina, dan terus menyempurnakan stick ini hingga akhirnya stick ini terjual di Februari 2010....kalau nga salah. From then on we mod the stick by shortening the shaft, switching the battop to a custom balltop, giving the shaft a cover, switching the buttons to leaf-switch ones, and perfecting the stick until it was sold on February 2010.